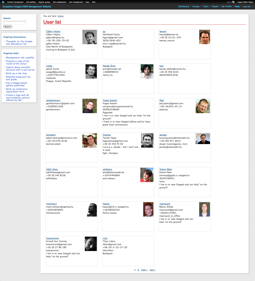 If you look at the Drupalcon Szeged 2008 website's tracker, you'll see that most announcement posts are attributed to me. This is all too misleading, because in many cases, I am merely channelling information collected and discussed by various organizers to the public website. This is the first Drupalcon for which the organizers have set up a management website, with the sole purpose to serve the organization team as good as possible, and while it is certainly not perfect, it works well so far. The "Do Drupaltown" website uses the core profile module, the organic groups and casetracker modules, as well as some small helpers like comment upload, upload preview, markdown with smartypants, diff and of course OpenID. Nothing earth-shatteringly special, just trying to work out easy ways to collaborate. The two basic requirements were to have work groups for specific tasks, in the name of limiting scope and handing out responsibility. An event organized with a thousand attendees expected has so many aspects it is very hard to have a good overview of each aspect. So we have an organic groups setup with some top level groups and several focus groups for tasks like producing (valuable) materials for the registration packages, discussing and solving venue tasks, and so on. Because in numerous cases, we need responsibles to hand out tasks to, organic groups nicely fits with its concept of group ownership and memberships. It also supports mailing updates when new content is published, which is good to drive idle volunteers to the site when things are happening. Since we are tracking tasks, these also need to have responsibles, an importance level, and a completion status. This allows us to have a running list of important tasks to complete, which helps us focus, know about the status of different jobs and get a distributed team to do that. Case tracker helps us there, it does integration with organic groups, so we can relate tasks to groups, email updates to tasks are mailed and severity and status flags are supported. We also have a patch pending for the views integration to be able to order by task priority, which was a trivial thing we needed to produce lists of tasks from most important down to less important. All-in all, our volunteers are happily working towards completing our goals, and we are marching on to come out with new exciting things for you regularly. Now that the public website of Drupalcon Szeged 2008 is building out, you will notice the volunteers themselves more there too, not just through my filtering.